board by putting its principles into practice. And found happiness in the process. For the management team the board then was more of an obstacle to be got round than something that might add value. But we had some good trustees and we could see that a better board might be possible. – a message that proclaims the importance of solid, just and equitable governance. Commitment to diversity is a basic essential of good governance so nonprofit organisations, one might expect, should have diversity policies and practices deeply embedded at their core. The international anti-poverty charity ActionAid has always been emotionally committed to diversity. It was just, at times, rather difficult to see it in practice, either from the outside looking in or from the inside, looking around. Equally ActionAid was always committed to gender equity and to gender balance at all levels, in all things. Only, that too was often hard to spot. For sure, hearts at ActionAid were in the right places and all intentions were just as they should be, but in the past the reality was often far from what it should have been. Back in 1977, when I started with the charity as UK director, diversity was a concept barely understood. ActionAid was very small then (it was known as Action in Distress until it changed its name to ActionAid in 1980). Board members when I joined the charity were all relatively rich white men from the south of England, all personal appointees of the charity’s founder, Cecil Jackson Cole (mostly they worked for CJC’s estate agency firm). Diverse, we were not. But the absence went largely unnoticed. it was policy, back then), all comparatively rich white men. From that moment we the management vowed to change. The great thing about ActionAid is that, slowly perhaps, the rest of the organisation followed. Around the late 1970s/ early 1980s an ActionAid board meeting provided an anecdote that sums up how imperfectly our unrepresentative board was functioning at the time. This meeting was important for ActionAid’s management because the board was being asked to approve a new programme in Burundi, a volatile and difficult place to work. We needn’t have worried; with the exception of one or two of the better-informed trustees already on our side, no one on the board had even the slightest idea where Burundi is, so the proposal was nodded through unopposed inside two minutes. On the same agenda was an item relating to the proposed new Grimsby gift shop. Now everyone on the board had been to Grimsby and most had strong views as to whether the north side of the High Street was better for shopping than the south side, so the board debated this choice back and forth for more than 20 minutes before the management got their way in the end. Over the years (I left the ActionAid staff in 1983 but returned 12 years later in a voluntary capacity, as a trustee) some modest progress was made. The senior management team under CEO Roland (Rip) Hodson moved towards gender balance and throughout the organisation a good picture of diversity began to emerge. Some eminent women joined the board, making a massive difference. But the board chair and CEO remained resolutely white and male. Serious change took hold in 1998 when Salil Shetty, from India, was promoted to be CEO. Salil brought with him a dedication to radical change, particularly his passion to see ActionAid commit to a becoming a genuinely international organisation in all its aspects within five years of taking up his appointment. Just as Salil was preparing to fill his new post, following three years on the board’s back benches I was appointed to chair ActionAid’s board of trustees. 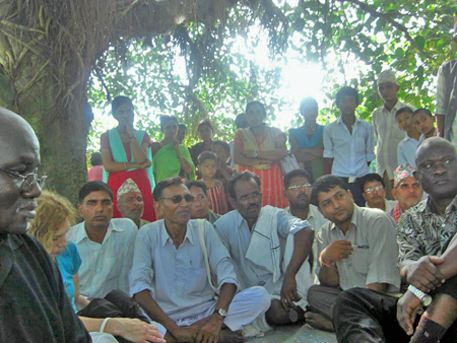 Thus ActionAid’s programme of Internationalisation began, driven by Salil and his team and supported by the trustees. The outcome swiftly led to a complete restructuring of the board, the move to a unified federal structure, creation of national boards for all affiliates and programme countries and a commitment to gender equity and diversity at all levels throughout the organisation. ActionAid’s strategy planning meeting in Bangkok in 2004 provided a stark contrast to that first international meeting in London back in 1982. This time there were 140 participants from 40 countries, 50 per cent were women, mostly Africans and Asians and there was clearly, evidently a much higher level of debate. Something significant had changed. ActionAid had made sure it did. My successor as board chair in 2003 was a Ugandan woman, Noreen Kaleeba, and a brilliant, charismatic leader and unifier she proved to be. Being part of her appointment remains one of the high points of my professional life. ActionAid now works in more than 50 countries around the world, from Afghanistan and Brazil to Zambia and Zimbabwe. It was the first major international charity to shift its international headquarters from a base in the affluent North – London, to a capital in the global South – Johannesburg. The first international chair of trustees elected under the new process was an African woman; the international chief executive who followed Salil was an agriculturalist from Nepal. Seated around ActionAid’s top governance table now you’ll find representatives from national boards that ActionAid has created and is supporting in Malawi, Guatemala, India, Sierra Leone, Greece, Ghana, Denmark, USA, Australia, Uganda, Kenya, the UK and others. ActionAid’s international governance system enjoys all the colours of the rainbow and all the flavours of an African street market. Though it started in the UK, British trustees are determinedly and deliberately thin on the ground. At one of my last board meetings there were more Indians and Brazilians than Brits. Experience to date seems to indicate that ActionAid’s board now does its job rather better too. In many countries the new ActionAid boards have been able to secure top brains and experienced campaigners for change of a quality that would have been hard to find and attract if we’d only been fishing in British local waters. These new, developing trustees include many academics, politicians, business leaders, legal specialists and opinion formers. Diversity brings better decisions by definition. In each country ActionAid’s new leaders know where the poverty is and what’s causing it, because they come from it and see it in their daily lives. It also brings credibility and acceptance too, as individual national ActionAids around the world are increasingly seen wherever they work as self-regulating independent members of a southern-led international family, not as agents of British or American influence. In today’s volatile international environment, this makes a huge difference. Continued in column 2, above. A picture of diversity: ActionAid's first international meeting in 1982 boasted just 11 senior staff, all white males, all relatively well-to-do, mostly from the south of England. 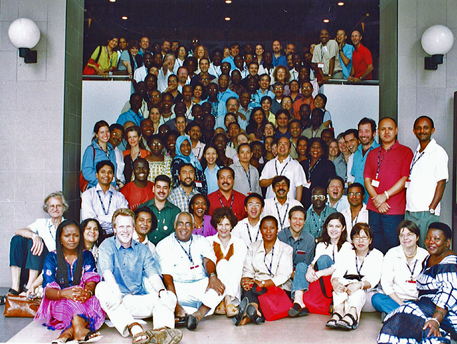 ActionAid’s Bangkok strategy meeting in 2004 (above) had 140 participants from 40 countries, 50 per cent women, mostly Africans and Asians. It also had a much higher level of debate. Seated front right is Dr Noreen Kaleeba, international board chair. Somewhere in there, at the back, is Ken Burnett, then a member of the new international board. 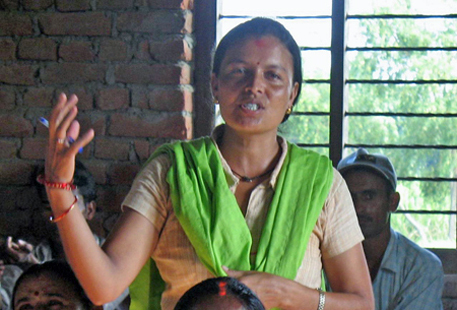 Nanda speaks out: ActionAid’s commitment to diversity mean voices such as Nanda’s are now more likely to be heard, at all levels. Photo Dinesh Singh. Meeting the right people in the right places: Dr Julius Spencer, left, board chair ActionAid Sierra Leone (next to Marie Burnett) and professor Uvie Igun, right, board chair ActionAid Nigeria, learn from village leaders in southern Nepal before reporting back to the international board. Photo Dinesh Singh. But will this move increase the impact that ActionAid’s donors will have on reducing poverty? Without doubt, it will. ActionAid’s response to poverty includes not just the traditional pillars of rights to education, health, land, food, water, livelihood, reproductive and women’s rights but also the right to sound democratic governance at all levels. By building exemplary boards at the country level ActionAid is sending a strong, consistent message to the people and political leaders of each country where it works – a message that proclaims the importance of solid, just and equitable governance. And the system will train and develop new generations of men and women from all backgrounds, each well versed in good governance and able to recognise what it is, and what it does, when it’s permitted to flourish. NB this account is based on the reflections and recollections of a former ActionAid staff and board member. It’s not intended to represent the views of the organisation as a whole. Please feel free to email me your thoughts on this article here. • Broken sandals, worth one more repair. • ActionAid: the ‘postal parent’ advert. ActionAid UK CEO Girish Menon gives an up-to-date view on this story here. See below for links to my special series on the future of fundraising and why I’ve become convinced that fundraising has to change.